What remains most striking about Philadelphia may be the...conspicuous emphasis on intense close-ups. They force an inescapable emotional intimacy in relation to issues the mainstream, at least at the time, would rather have looked away from. 125 min. Sony Pictures Home Entertainment. Director: Jonathan Demme. Cast: Tom Hanks, Denzel Washington, Jason Robards, Mary Steenburgen, Joanne Woodward, Antonio Banderas, Charles Napier, Anna Deveare Smith, Bradley Whitford, Roger Corman, Ann Dowd, Tracey Walter, Chandra Wilson, Roberta Maxwell, Daniel von Bargen. As the first Hollywood studio feature to address AIDS, 1993's Philadelphia arrived under a weight of expectations and, to some extent, into a climate of fear. This mainstream-cinema litmus test for gay themes before straight audiences struck many vocal social progressives as a near-artlessly pandering, reassuring end run around the realities of the disease and gay life. Nevertheless, here is a film—not much more than a decade out from the onset of the AIDS crisis—that features, in a leading role, a movie star made up with Kaposi's sarcoma lesions. And though the film may be neutered in some respects, director Jonathan Demme makes a calculated choice to be, in visual and humanistic terms, "in your face." 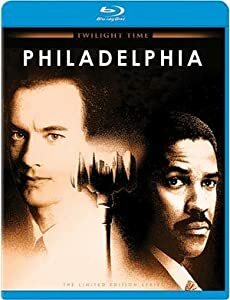 Philadelphia derives from the true story of New York lawyer Geoffrey Bowers, who battled AIDS while pursuing an anti-discrimination lawsuit against his former employers (ironically, Bowers' family had to sue the filmmakers to arrive at a settlement for the use of Bowers' story). Tom Hanks plays Andy Beckett, a "crackerjack" up-and-coming lawyer at the prestigious firm of Wyant, Wheeler, Hellerman, Tetlow and Brown. At the outset of developing noticeable AIDS symptoms, Beckett finds himself named senior associate and handed the firm's biggest case. But a telltale lesion gets Andy fired, under false pretenses, and sets him on a course to win justice. Here, Oscar-nominated screenwriter Ron Nyswaner veers from reality by pairing Beckett with an "ambulance chaser," Joe Miller (Denzel Washington), who advertises his personal-injury firm on TV. Even in New York, Beckett incredibly can't find anyone else who will take his case—even Miller nearly doesn't, due to his pronounced homophobia. Miller's wife (and mother of their infant child) remarks that Joe has "a problem with gays," and hardly disagrees: he's defensively vocal about his heterosexuality and his disgust with the homosexual "lifestyle." This business works best when Washington is directed away from his hammy instincts, as when Demme tells the story of Miller's prejudice through angles, edits and subtle glances as Andy makes contact with items in Joe's office. Philadelphia quickly becomes an all-out assault on homophobia, on multiple fronts. There's the unavoidable symbolism of the setting, the "City of Brotherly Love" where the founding fathers adopted the language that "all men are created equal." There are the lovable Hanks playing an essentially sainted gay, closeted at work but fully embraced by a loving family (led by Joanne Woodward's matriarch) and an equally saintly boyfriend (Antonio Banderas); the corporate-lawyer villains (including Jason Robard's erstwhile mentor) shamefully turning their back on Andy; and the obvious irony of his African-American lawyer learning, gradually, to overcome his prejudice and love his client. Another obvious irony, of course, is that this film about coming to know gay people doesn't allow Andy to be a very rounded character: he's gay, he has AIDS, he has a boyfriend and a cause, but as a person? He's a lawyer who's "Tom Hanks-y" (read funny and kind) and loves opera. That last point allows the film's showcase scene—Hanks' Oscar clip—in which a monologuing Andy draws Joe into a transcendent, dreamy moment of union as Maria Callas sings "La Momma Morta" on the stereo. It's literally full-tilt Demme, as the angle goes Dutch and the lighting goes "Flame on!" Given the thudding message-movie obviousness of it all, played out in disease-of-the-week and courtroom-drama tropes, it's no surprise that the film's working title was "People Like Us." And yet, hard as it may be to believe two decades later, Philadelphia was probably the middling gay drama many Americans needed in 1993, when the closet door was still quite tightly shut. It didn't hurt that Hanks won the Acdemy Award for Best Actor (a scenario warmly lampooned in Paul Rudnick's 1997 gay romantic comedy In and Out). Even just as a film about an anti-discrimination lawsuit, of any kind, Philadelphia represents a breakthrough: try to name a prior Hollywood picture on the subject. What remains most striking about Philadelphia may be the way Demme and longtime cinematographer Tak Fujimoto shoot the film, with a conspicuous emphasis on intense close-ups. They force an inescapable emotional intimacy in relation to issues the mainstream, at least at the time, would rather have looked away from. Framed with fly-on-the-wall montages of city life and family life, the picture ruthlessly makes the (admittedly squishy) statement that we're all the same and therefore in it together. Demme literally underscores the point with star musicians: Springsteen won a Best Original Song Oscar for "Streets of Philadelphia," but it's Neil Young's nominated "Philadelphia" that provides a surgical strike of sadness at film's end. Add potently subtle expression by Hanks that transcends the script, and this anti-homophobia tract—patronizing and blunt though it is—starts to look pretty effective, at least as well-meaning propaganda. Twilight Time offers a terrific Blu-ray upgrade for Philadelphia, which looks better than it it has in twenty years. Though some of the flesh tones have a slightly unnatural cast that seems endemic of films of this era on Blu-ray, that's a quibble with an otherwise excellent, clean, and film-like transfer that maximizes the source material. No compression artifacts mess with the film grain or detail, which sometimes achieves a sense of depth. The lossless DTS-HD Master Audio 5.1 mix is mostly front-heavy, but again maximizes the source material with a clean and clear presentation that adds body to the music. Happily, Twilight Time is able to include some of the bonus features previously available on DVD. These include a selection of "Deleted Scenes" (11:18, SD), raw "Courthouse Protest Footage and Interviews" (4:26, SD) from the shoot outside the courthouse; the EPK "Making of Philadelphia" (5:59, SD) with behind-the-scenes footage and interview clips with Tom Hanks, Denzel Washington, and Jonathan Demme, and the "Original Theatrical Trailer" (3:03, SD). The two audio features are the most prominent ones, however. As is customary on Twilight Time releases, we get the Isolated Score Track (in DTS-HD Master Audio 2.0) of Howard Shore's score and a 2004 audio commentary with director Jonathan Demme and screenwriter Ron Nyswaner. The latter is a nice retrospective conversation, with memories of the film's origins, making, and participants (including the deceased). All site content © 2000-2019 Peter Canavese. Page generated at 04/20/2019 09:20:19PM.